I have lowered the front of my 106 about 4cm. 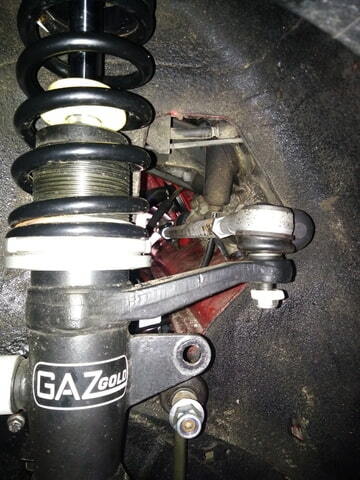 I have converted the front struts to GAZ gold and told them to lower the steering arms 4cm as well. I haven't measured the original positions of the steering arms on the strut before I sent them off to GAZ, so don't know whether GAZ has lowered the steering arms correctly. Anyway, today I was fitting helper springs to my front setup and made the following picture. I can see that there is already a positive angle from the steering rack mounting point to the tie rod end, meaning the tie rod ends sit higher than the inner tie rod ends. This will only increase once the car is back on its wheels. Shouldn't the steering rods have a slightly negative angle to minimise the bumpsteer effect?